Run Oklahoma recently posted about adventure races in the state or neighboring states. There is another that must be added to the list and it’s the 2nd Annual OCW Ranch Run. If you can’t gather from the name, it’s a race run through an actual ranch. So for all the city folk or The Pioneer Woman fans, it’s a fun way to get up close and personal to real ranch life as well as supporting ranchers in our state. The Oklahoma CattleWomen, Inc. (OCW) is the voice for women in the Oklahoma cattle industry. OCW’s mission is to promote efficient production of beef, educate consumers on the nutritional values of beef, and communicate goodwill within the communities and state. Last year was the 1st Annual OCW Ranch Run held at the Hicks-Didlot Cattle Co. Ranch in Altus, OK and wove through the ranch in a way that perfectly featured all the charms of a southwest Oklahoma operation. The race included a 5K as well as a smaller Fun Run for those still getting into the running game. After the race, runners were treated to Breakfast Beef Burritos and were able to talk with the CattleWomen and ranch owners about animal care and how beef could better their diets as runners. Each runner also received a commemorative tank-top for the race. The winners, Sarah Yeom (1st), Amanda Langham (2nd) and Shelly Vinyard (3rd) were awarded medals for their accomplishments as well as beef certificates! 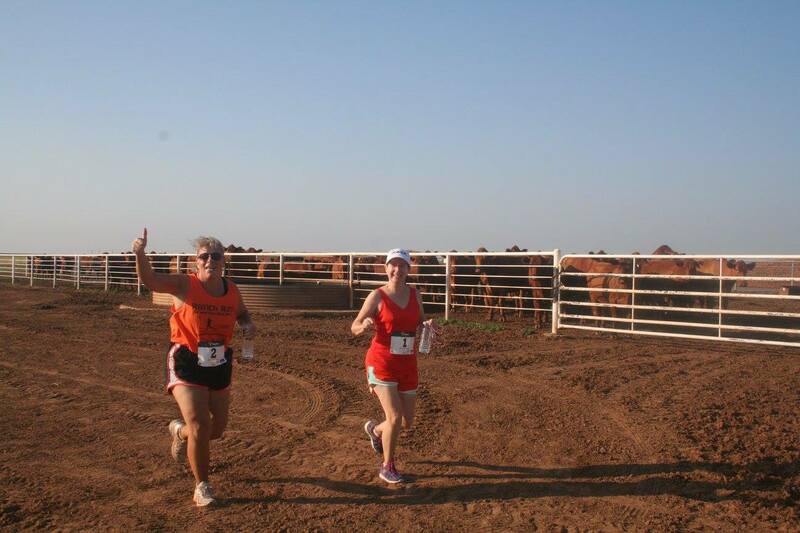 This year, the OCW Ranch Run will be held on August 20th at the Hicks-Didlot Ranch in Altus, OK. Registration is open to both adults and youth and will be open until August 17th. Late registrations will be taken the day of race as well. Check-in begins at 7:00AM and the race will start promptly at 8:00AM. There are two races; the Ranch Run 5K (3.2 Miles) and the Fun Run (1 Mile). Prizes for this year’s race are yet to be determined but expect something delicious! And don’t worry if you are unfamiliar with ranch life as the track will be well marked and the ground will be worked to perfection by the ranch owners in preparation for the race. Runners can find more information/registration papers on their website, okcattlewomen.org or through social media by following @okcattlewomen. Please contact coordinators of this race, Tammi Didlot (405-409-7633) and Becca Laisch (405-596-2518), with questions or concerns. So you’ve signed up for a race in Halloween costume race. Even though you planned and expertly executed your training, your plan for a costume is still lacking. Never fear, Run Oklahoma has some quick, easy, do-it-yourself costume ideas that even the best procrastinator can pull off. Running Bandit – You’re dressed as a bandit and you’re running in a race. Get it?! Well, regardless of the cheese factor, Lia Griffith still came up with a totally easy costume to put together. 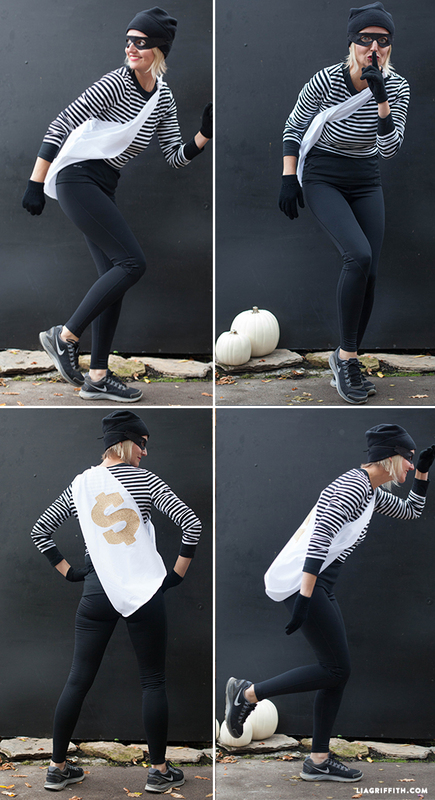 Black leggings, black gloves, black hat, black mask, and a little fabric with a dollar symbol and you’re ready to run in a completely functional costume. Skeleton – What would a Halloween racing costume be without a spooky costume? 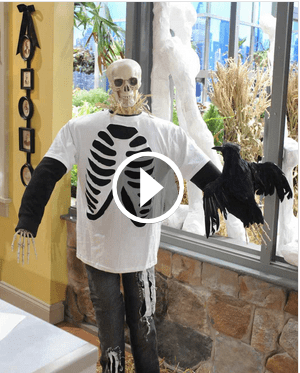 Well thank your lucky stars that Martha Stewart has you covered with a tutorial video and templates to create a skeleton rib cage cut out. Pair it with black running tights and if you’re feeling adventurous throw on some skeleton face paint as well. 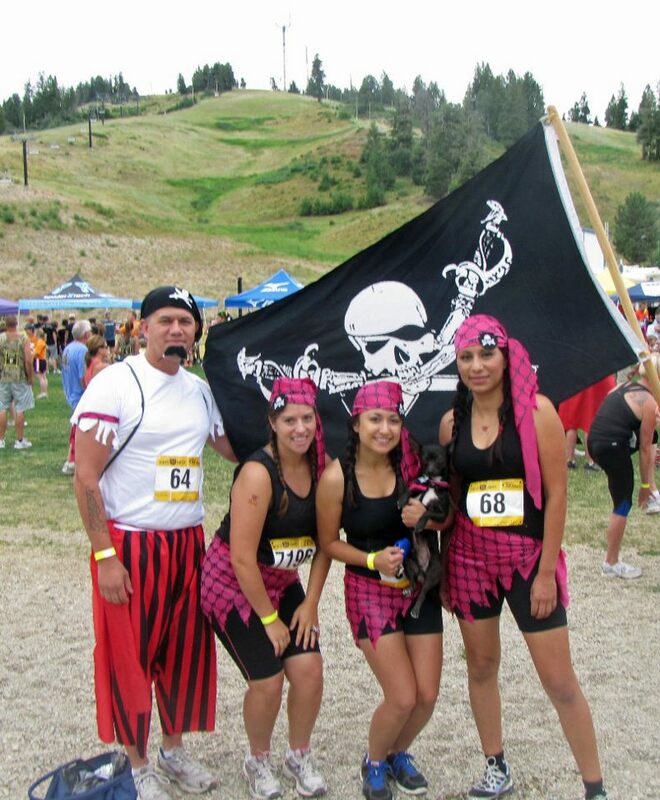 Pirate – Pirate costumes can be easy to create AND conducive to running. Are you sensing a theme here? All you need are a few yards of your favorite pirate fabric. Cut it to create a head scarf and a sarong. Fray the edges of the fabric to give it that swashbuckler feel and you’re set. Photo from Another Mother Runner. Baker and Gingerbread Man – This idea is great for couples. All you need is an apron and rolling pin for the baker. 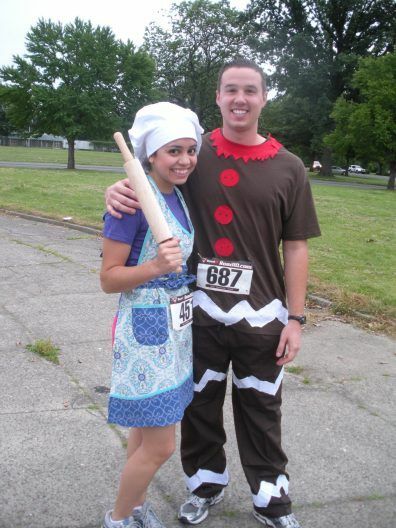 The gingerbread man costume can be some inexpensive scrubs or sweats painted with fabric paint. Totally cute. Totally versatile. Run run just as fast as you can. You can’t catch me I’m the Gingerbread Man. I don’t think God made a more perfect month than October. The cooler temperatures, foliage, and wide variety of race offerings make running outdoors in Oklahoma a delightful experience. Here are a few races that may tickle your October running fancy. Gotta Have a Beer Run – There is an obligation for runners over the age of 21 to run a beer race in the month of October. 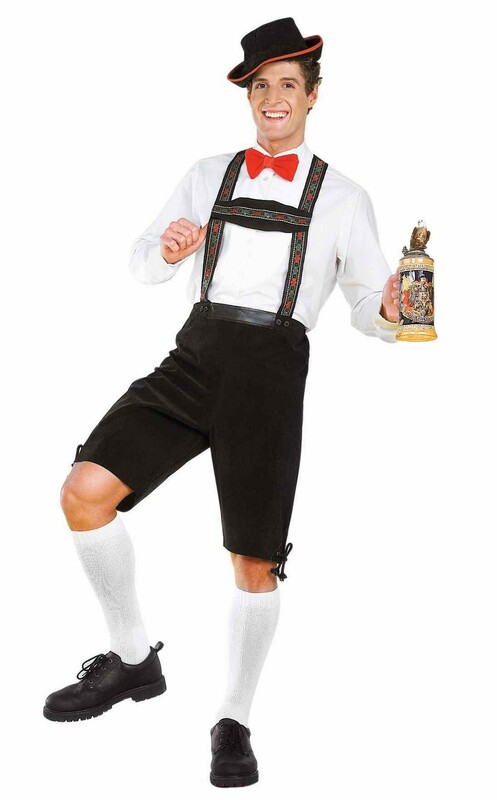 If you aren’t of the legal drinking age, at least Red Coyote is providing you with an opportunity to run the Runtoberfest 5K in your lederhosen. Gotta Have Your Own Distance Run – The HITS Running Festival is making its way to Oklahoma City this year and offers a distance for everyone (1 mile all the way to marathon). Each race will FINISH inside Chickasaw Bricktown Ballpark while traversing the FLAT & FAST course over soaring Skydance Bridge and manicured River Trails along the Oklahoma River. 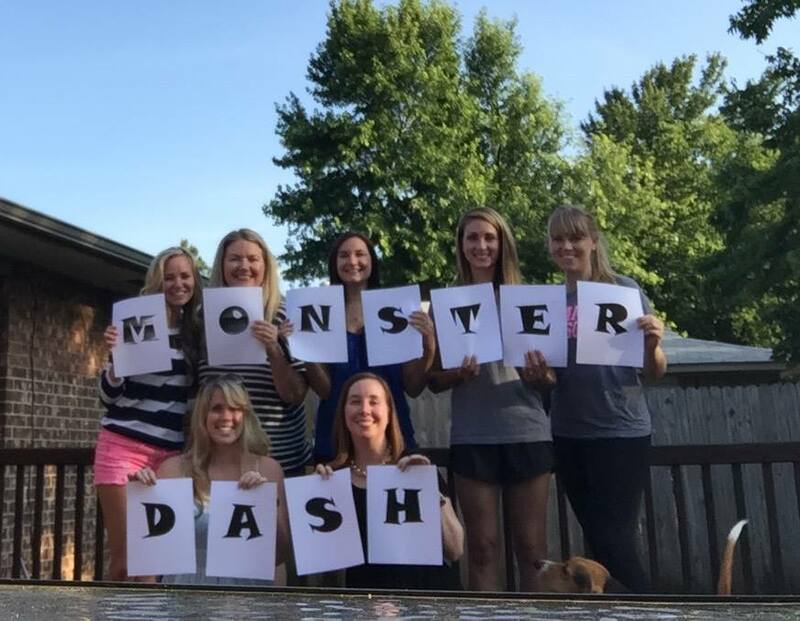 Gotta Have a Costume Run – On Halloween day, you can dress up in your costume and get out and participate in the Monster Dash at Reeves Park in Norman. It’s a great way to burn some calories and earn all that candy you’ll be gobbling up later that night. Wow! What a summer it has been. Posts to Run Oklahoma have been few and far between lately because I have a job that has some seasonal aspects to it. The summer months tend to be the busiest where workloads increase by almost double. So I’m so excited that my job is starting to slow down and come to a much more normal pace, meaning that I can use my spare time to work on things I love, like Run Oklahoma! Yay! Even though I wasn’t posting much to Run Oklahoma, that didn’t mean I wasn’t thinking about running. If you follow my Instagram account I’ve been diligently training for the Tulsa Half Marathon. Training has been going well. I’ve been able to remain injury free and even though I have to make adjustments to my training schedule due to LIFE I’m getting my miles in. Other exciting news is that I joined Oiselle Voilee. 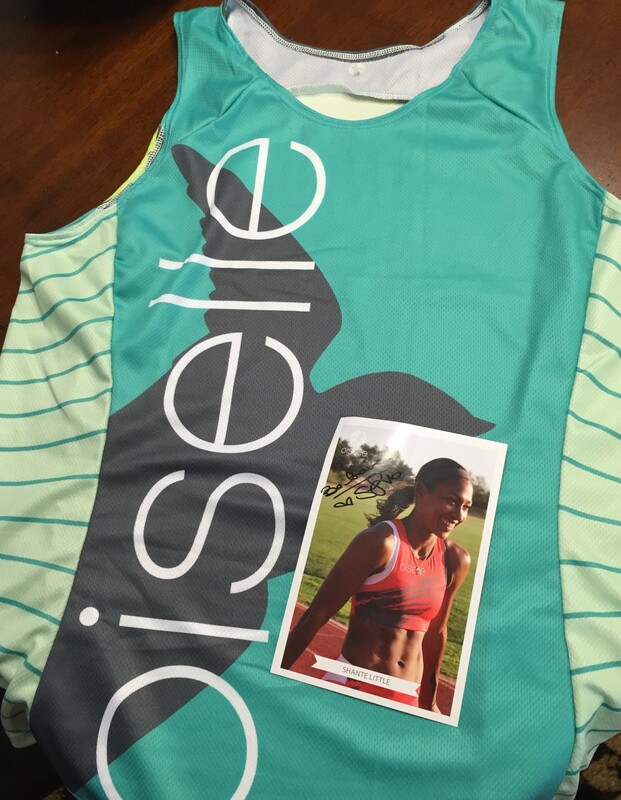 Oiselle is all about helping women run free and fast! Currently Voilee has 750+ women from across the country who represent the Oiselle brand as they train and race toward their running goals. I’m lucky enough to be one of them! Above all, the team is about seeing running not just as a sport, but as a life philosophy. I’m so excited to be connected to such an amazing group of women (and some “bro birds” too) and encourage and support each other in our running endeavors. 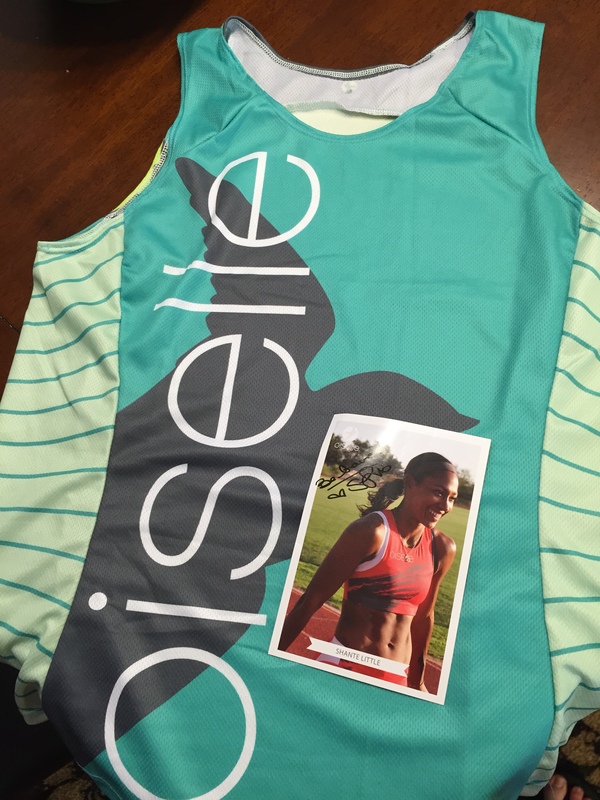 I’ve recently received my racing singlet and am sooooo excited to wear it to my fall races! Last, but certainly not least, this summer was a moment of reckoning for me in terms of my nutrition. As my running goals get a bit more aggressive I was continuing to take short cuts with my nutrition. I wasn’t seeing the results I wanted to. Obviously, I’m not 21 anymore and I can’t continue to put junk in my body and hit my fitness goals. 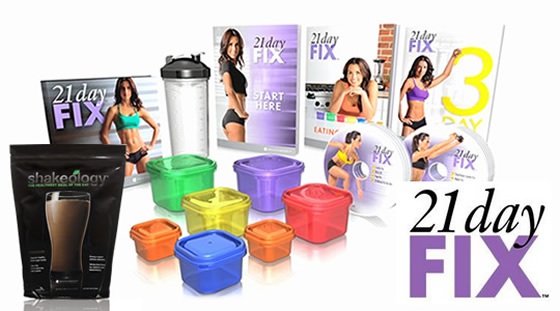 So I decided to take the plunge and give the 21 Day Fix a try. One of the reasons I decided to give it a try is because it is NOT A DIET. But rather a simple, no-fuss eating program that uses a portion control system to help determine how much of each food group you should consume daily. Besides, who doesn’t like the brightly colored tupperware that comes along with it! I’ve seen great results and have actually enjoyed the way I feel and energy I’ve received from using the program. I don’t want to give too much away cause I’ll have separate post on my 21 Day trial coming soon. Pheeeewww! A lot’s been going on this summer. What have you been up to? 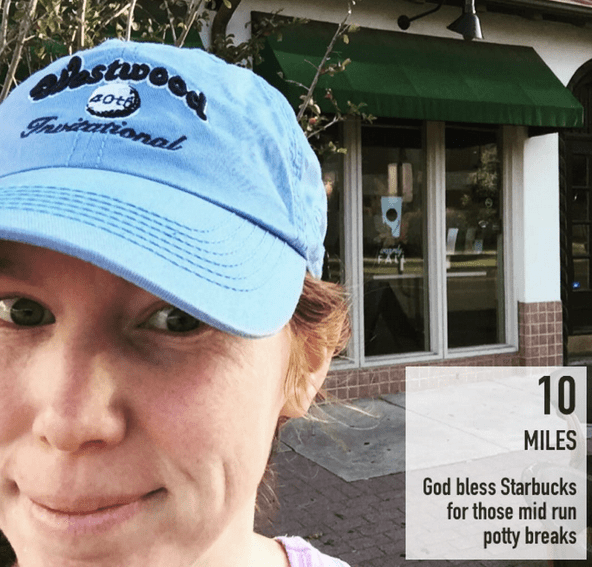 Training for upcoming races? Taking a break with pool parties and cookouts? Just starting out as a new runner? Whatever you’ve been up to I’d love to hear from you!